When you see one of these oversized, green metal cans, you know it can only be one thing, ammo from Russia. But unlike most of the Russian ammo cans, this one does not contain old military surplus rifle ammo. 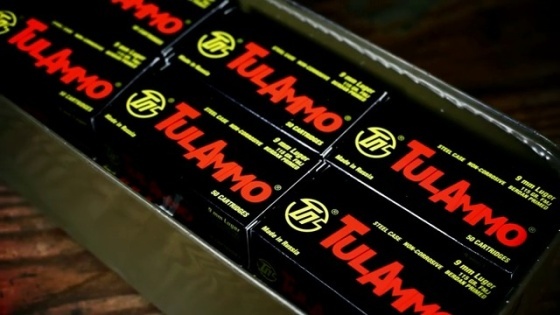 Its newly manufactured 9mm pistol ammo from Tula. Tula is one of Russia's biggest ammunition makers. And they ship a lot of affordable steel-cased ammo to us over here in the US. These sealed metal cans are often referred to as spam cans, named after everybody's favorite non-perishable meat. Sealing up your fake pork product in a metal can makes sense, because nothing really beats it for long-term storage. It turns out the same thing is true for ammunition. You always hear that you should store your ammo in a cool, dry place. Well, you could probably stretch that rule little bit with these things. I wouldn't necessarily want to try out this theory, but I bet the ammo in these cans would hold up to a couple of decades in a leaky basement in the Florida Everglades. The outside will get corroded and rusty. But it's supposedly airtight and watertight, so it really takes a lot to damage the ammo inside. Of course, this presents a minor problem when you go to access the ammo. Unlike spam or sardines, there's no convenient pull-tab to help you get the lid off. So how do you liberate your wonderful new ammo from it's hermetically sealed prison? The obvious solution is to try to cut it open. And when that doesn't work, maybe use a hack saw or power tools. No, real power tools. Oh, that might be a bad idea. We'll have to get creative. You can try melting it. No, with acid. But that might hurt the ammo. Wait. What's this? Oh, right, a can opener. Fortunately, for you and anyone living with you, every can of Tula ammo ships with a heavy-duty can opener. It's probably not the fastest method, but it's the best way to safely open the can without damaging the ammo inside or yourself. Inside the can, all the ammo is packed nicely in the center with cardboard around the sides for cushioning. 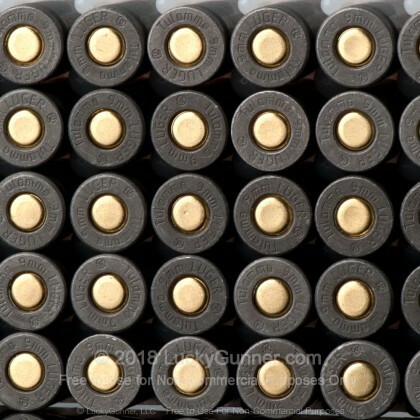 The 900 rounds of ammo are divided into 18 50-round boxes. The load in this one is a 115-grain 9mm. The steel case is not re-loadable, but uses a non-corrosive primer. It's coated with a thin layer of polymer to help increase shelf life and reliability. 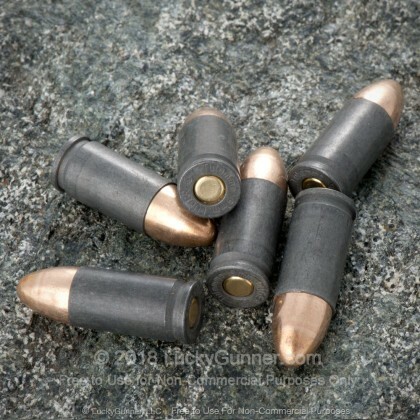 Bullets have a bi-metal jacket made of copper and steel. But despite rumors to the contrary, the core of the bullet is lead. Even so, some shooting ranges believe the bi-metal jackets are a little rough on backstops and steel targets. So make sure this ammo is allowed at your range. After we figured out how to get in the can, we got to shoot the ammo to see if it was worth the effort. We used six different guns to try it out, five pistols and one carbine. One of the first things we noticed was the mild recoil. Compared to a lot of other 9mm loads, this round is pretty soft shooting. So if you plan to blow through all 900 rounds in a day, your arms shouldn't get too tired. For the most part, we didn't see any issues with function or reliability of the ammo. But we did run into one failure to fire problem. In our Beretta carbine, the primer of one round went off, but failed to ignite the powder. There was just enough force to send the bolt back. And the cap of the primer flew out of the primer pocket. Since the powder did not ignite, the bullet stayed in the casing and didn't lodge in the barrel. No damage was done. And the rest of the ammo fired as expected. We took the carbine back to the 25-yard line and fired groups for accuracy from a bench rest. We ended up with one big hole just below the point of aim, which is pretty respectable for the humble Russian cartridge. Despite the one failure to fire, the Tula ammo performed well over all. The steel casings didn't pose any problems for our test guns. And the mild recoil makes it easy to shoot. 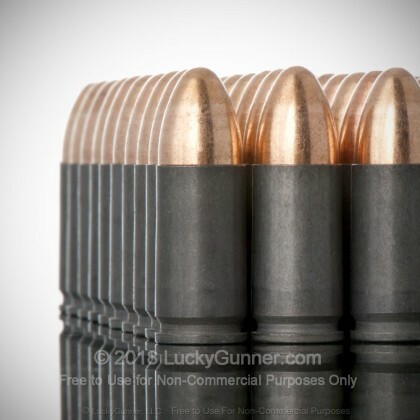 More expensive ammo might provide better quality control and reloadable brass cases. 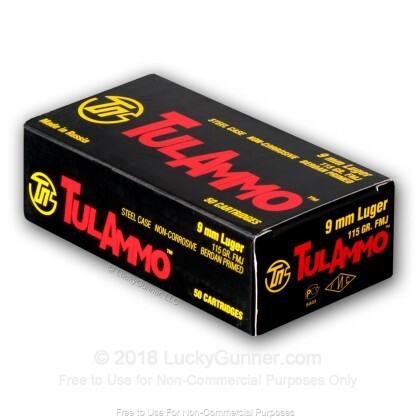 But if you want to stock up in large quantities so you can take your future grandkids to the range, Tula provides an economical option with their sealed cans of 9mm. 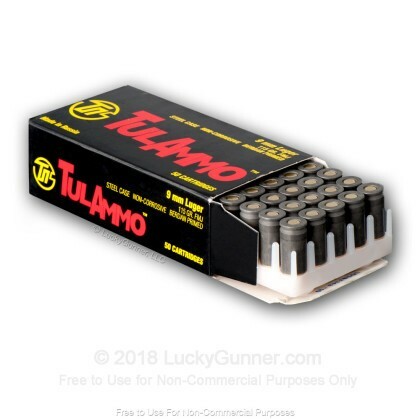 I have no trouble with Tula ammo. Good groupings, no ejection problems from my Ruger p 89. Some jamming with an older, small frame Italian gun I sometimes use. It is very picky about ammo so I tend to blame the gun, not the ammo. Fantastic ammo for range use. Shot all 900 rounds thru my CX4 storm with no misfires or jams. I will be buying more soon. This was my first time using steel casings, but I have no worries after this experience. Lucky Gunner is the only place I buy ammo now. Keep up the great values, whether it is high end ammo or cheap range ammo, I always get great quality ammo at the best prices. I would avoid these unless they are strictly for practice on the range. Even then, you will be treated to about one primer malfunction in every 20 rounds. And they are dirty. Good news is you will get plenty of opportunities to practice malfunction drills. Great deal for great ammo! Just took my Tula 9mm out this weekend and I loved it. I shot 300 rounds though my Sig SP2022 and it worked great. I had one round jam while rapid firing but other than that it seems fine. Plus its fun to receive the ammo in the big tin can that needs a special tool to open it up. Thanks LG, I will be using this ammo from now on. Have burned through thousands of these and haven't had a single FTF, maybe 3 jams. Nothing but good things to say about the ammo and Lucky Gunner! Always have my order within a few days and never a problem. 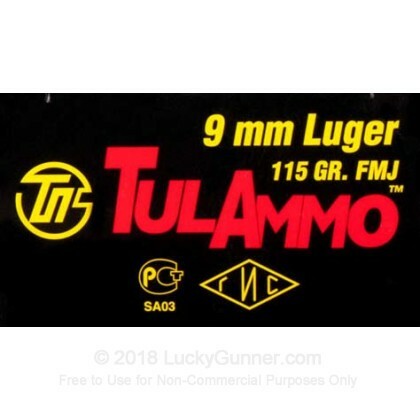 For the price and quality this ammo is great. I have fired it in my Glock model 19,21 and my Hi-Point 995T with out any issues.I will be buying more to keep stocked up. I purchased this 9mm ammo for target practice. The order was shipped promptly and arrived undamaged and reasonably quickly, although I did not request expedited shipping. I did request the additional unmarked box primarily to reduce the likelihood of pilferage. 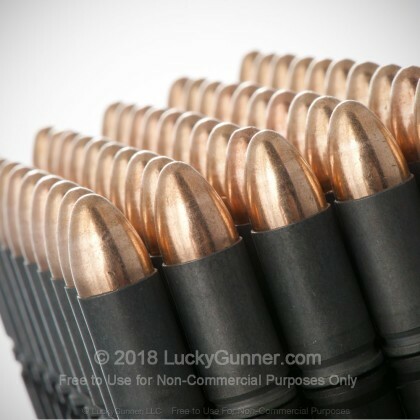 The ammo has fed well and I have no complaints except for one. Due to a lack of attention to detail on my part, I did not notice that this ammo was made in Russia. As a rule, I do not purchase anything from Russia due to a desire to avoid supporting their economy (hence their government) in any way. I will pay more for ammo produced in other countries, if necessary, in the future. Other than that, I have been pleased entirely with this purchase. Giving three star for the simple fact that I'm pleased with the way the ammo showed up but have yet to fire any of it. So the middle of the row is the best review I can give. This was my first online ammo purchase online and my first with Lucky Gunner. I was pleased with the speed, accuracy of the order, and customer service. I found the website easy to navigate and very straightforward in it's layout and pricing. 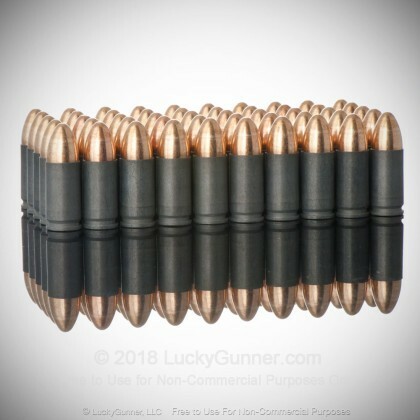 I found the ammo to be a great value for the money. I have fired about 400 rounds of it through my Sig Sauer P226 Tak Ops and have had zero jam's or issues. it is the right fit for shooting on the range or practice. I may try the the Mag Tec next or the American Armory brand. 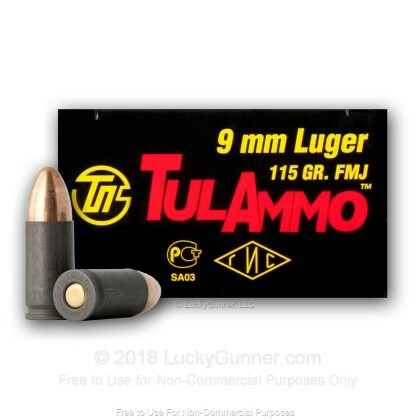 I would recommend this ammo if your looking for a good deal on 9mm bulk ammo. I highly recommend The Lucky Gunner to all my friends! After going through 150 rounds of this ammo through my Hi-Point 995TS I was pleased to have zero problems with it. It shot quite accurate but did seem a little dirty compared to other ammo. 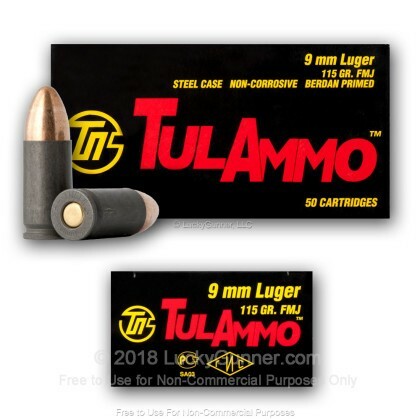 Overall a great value and perfect for plinking. Also shipping was quick and reasonable priced. 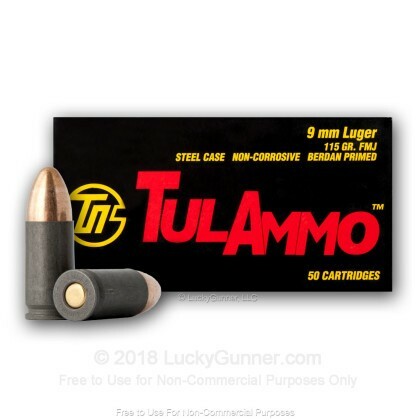 I am always lookin for cheap target ammo and I found it with Tula. I've shot about 2k rounds and had maybe a dozen FTFs'. Its clean ammo that shoots well. if ya dont like steel this stuff might change your mind! Bullk price is amazing and I will keep buying. Add a better tool to open can with. The only problem was the can it came in. Hard to open even with enclosed tool. I don't order from anyone else! you have to look at! The only problem I've had is the indoor range I go to doesn't like non-brass casings. Other than that it's fired great, no misfires and not too dirty. 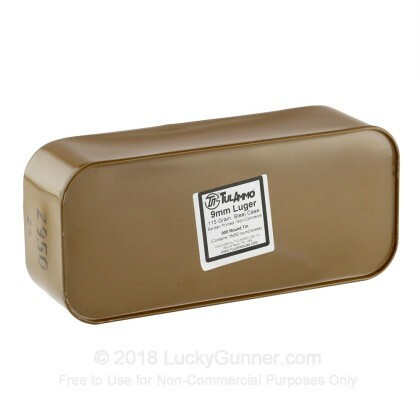 A: Hello LaRue, The 900 round spam can of 9mm should be about 30 pounds, and the 1000 round case of 180gr. FMJ in .40 S&W is about 43 pounds.